BPG Cohn & Wolfe is part of BPG Group, one of the largest integrated communications groups in the MENA region. With offices throughout the Middle East, BPG Cohn & Wolfe provides a gamut of specialized strategic communications services that cover the entire realm of PR and Social Media disciplines. BPG Cohn & Wolfe wanted quick, exclusive insights from the adult general population to understand the level of impact social media influencers have on consumers within the areas of fashion, beauty and food. The definition of influencer for this study was ‘the power of a person to be a compelling force on another person’s actions, behavior, opinions’. 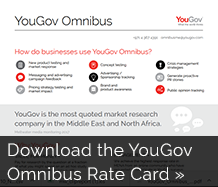 YouGov’s quick turnaround Omnibus online research service presented the perfect solution to interview a representative sample of the adult general consumer population in the country. The Omnibus team worked with BPG to design 10 questions to ask members of the YouGov panel in the UAE. Care was taken to ensure the questions were simple and easy to understand to achieve the highest response rate possible. The survey was launched to YouGov panel members in English and Arabic, and within 7 days responses had been collected from 1,008 UAE consumers. The results were delivered as excel data tables with counts and percentages per question recorded according to different consumer profiles such as gender, age, Emirate, children in household, working status and marital status. 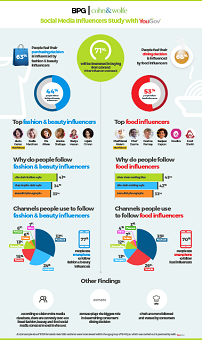 The findings enabled BPG Cohn & Wolfe to identify the most influential icons in the fashion, beauty and food areas where UAE residents are most likely to turn to leading social media influencers for recommendations. Focusing on those who were specifically active in the online media space they could ascertain how the general population were interacting with each influencer and most importantly how much these influencers could sway consumer’s purchasing decisions. This invaluable insight enabled BPG Cohn & Wolfe to address the needs of their clients, specifically looking to invest in influencer communications strategies, with a fully informed view from the very people their clients were looking to engage. BPG Cohn & Wolfe also used the findings to issue a press release & infographic to the media to help raise the profile of their brand in the context of influencer communications securing media coverage in 65 media outlets across the UAE and initiating a debate amongst the key opinion leaders of the communication industry.